Since I started working on the subject of religion and the American Revolution, the central question has been: “what does that mean?” It’s a topic that has to be broken down into more specific pieces, and the most pertinent version of the question varies significantly by vantage point. 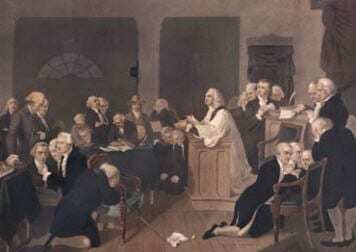 In our national conversation, it’s often taken by Christian nationalists to mean something akin to the faith of the founding fathers. The parameters of the assignment were two fold. 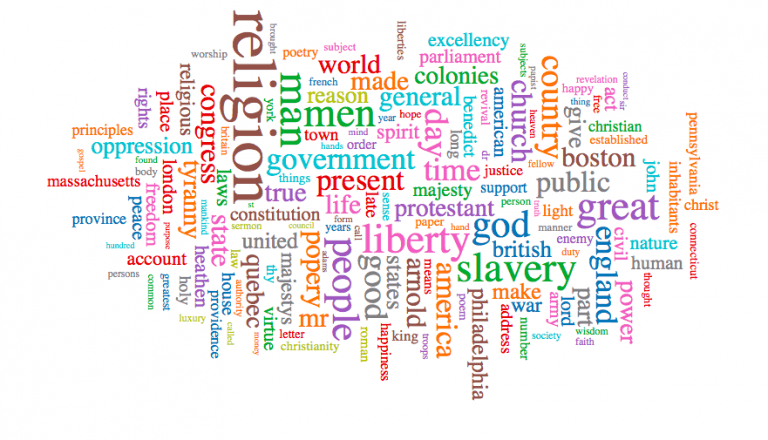 Within the context of the period from 1763-1789 (dates determined by Readex’s check boxes), students investigated topics that either involved the word “religion,” or that had to do, in their conceptions, with religion. The results were truly wonderful, and in this space before too long we’ll have more detailed reports from individual students. My strong first impression, however, is that students have done a wonderful job of encapsulating the diversity of the subject of religion and the revolution. They examined leaders and military events, anti-Catholicism, poetry, treatment of Native Americans and the absence of their voices, port cities, revivals, the presence of politics in religious venues and the absence of “religion” in newspapers, and, importantly, slavery. Two students asked versions of Morgan’s American Paradox question, long before we read the article. I couldn’t be more pleased with their work, which I think will be part of a lasting effort to which future students can contribute. Since this is a DH project, we can produce, via Paper Machines and Zotero (our tools of choice), some early overviews. 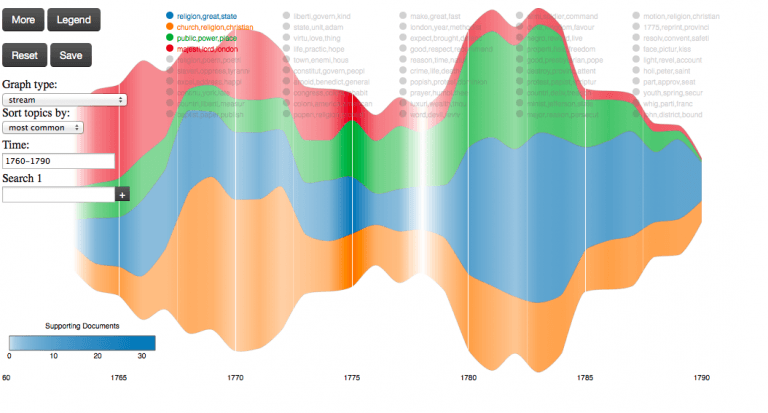 Looking the whole corpus of data, the visualizations mostly show what students researched. We had fewer articles in the war years than at other points. Students were more drawn to the pre-war period, perhaps as a result of the class’s chronological focus; we’d spent more time on the “before” period. Just as important, students’ interest in slavery and the south drew them to later periods, when there were more southern newspapers in the collection. 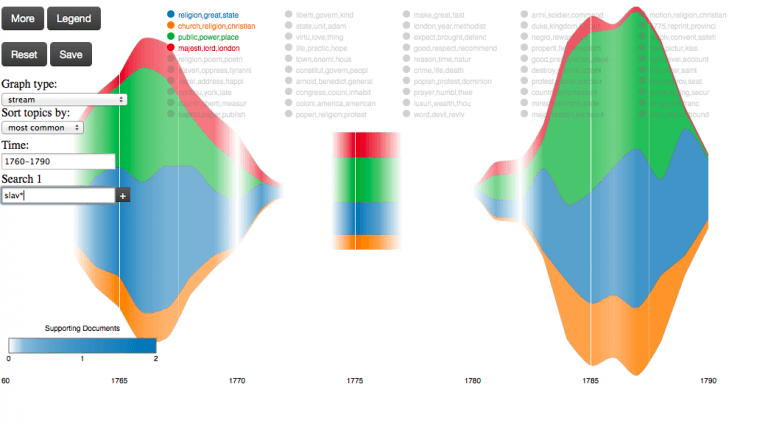 Topic modeling is an imperfect tool, but it points to the key facets here. The blue bar, religion/great/state, seems at the macro level to point to a kind of religious patriotism that remained quite stable. Similarly, the green bar, public/power/place, shows the importance of politics to our study. 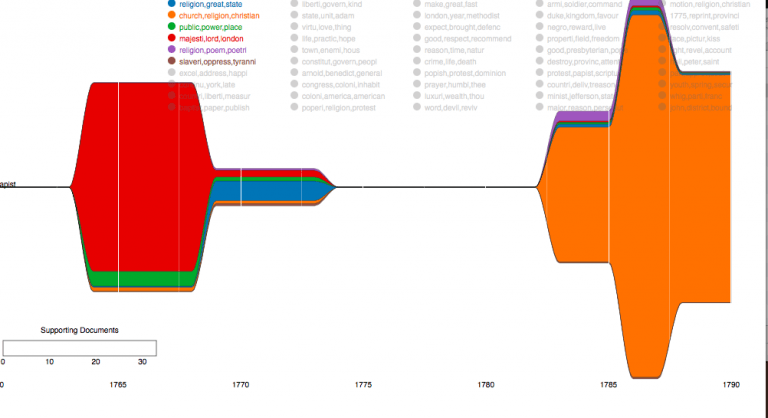 The red and orange bars highlight political manifestations of the pre-war religious establishment. The orange “church/religion/christian” conversation is linked to the struggle with Britain, and fades after that. One suspects strongly that it would pick up significantly after 1789. The red bar, majesti/lord/London, is dominated by news from Europe and legal documents. (Lord is almost certainly as in Lord North, not Lord God.) Again, that topic loses its place as time goes on. Students found a lot on anti-Catholicism, even when they weren’t looking for it. This visualization traces the word “papist” through the various topics. It is mostly encompassed in the majesti/lord/london bar, before the war and then transforms into the church/religion/christian topic after. There are some great questions there too. Slavery, the moral question that our class and country cannot and should not let go, was distributed too widely to be a separate topic. The students will have some useful investigations into the specifics here. Last, here’s a word cloud. Most of the students chose to do word clouds for their visualizations. They’re the easiest, and students for whom Paper Machines didn’t work (Windows 10 machines) could get to them quickly through Voyant. But they also proved to be useful tools for students who were unfamiliar with any form of distant reading. The students also found some interesting things there, and they’re pretty. I’m fine with that. Tuesday we return to reading articles and documents.